Available today, a new photo editing app that lets you easily share panoramas and 360 degree photos as swipeable carousel posts on Instagram. Instagram-enthusiasts will be pleased to know that there is finally a way to post your panoramas and 360 degree photos on the service. Swipeable wants to give you a complete photo sharing experience – from a square photo to a 360 degree photo. It’s fun, it’s simple and it gives you a new way to share your best moments. Photos are no longer flat and cramped. They can be interactive, immersive, and surrounding you. It hasn’t been easy to share photos captured by panorama apps or 360 degree cameras on Instagram. We know that you want to share a complete picture of your entire adventure, a gathering with besties, or a momentous life event. Now Swipeable lets you recollect your memories in a swipeable post on Instagram. You can feel like being there again. It makes experiencing Instagram photo never the same. 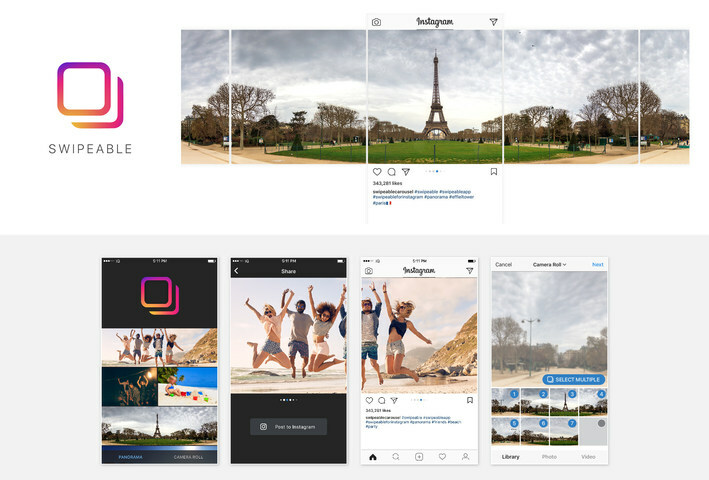 Swipeable is meticulously tailor-made for Instagram users. Just pick up your panorama and the app does the rest. Its neat, simple and intuitive user interface navigates you in photo sharing. Swipeable automatically divides your panorama into square pieces. You will be able to share the photo with the coolest new Instagram feature – Multiple Photos. Apply a single filter on everything and a single caption and location as well as likes and comments will apply to the whole post. Friends can swipe back and forth to explore your journey. Swipeable is available for FREE globally. It’s currently available for iOS devices in Apple’s App Store. Swipeable will be available for Android devices in the coming months. Swipeable is developed by Holumino Limited. – a mobile app developer specialising in 360 capturing technology which is founded in 2014.